The Murzan PI 50 is the only diaphragm pump specifically designed to meet the special requirements of the sanitary industry. High efficiency oil free air valve, maintenance free check valve systems, and total visual inspection of all wetted parts give the user a safe and efficient transfer of foods, cosmetics and pharmaceuticals. USDA listed, FDA Approved, the PI 50 series is manufactured to meet general 3-A standards. The Murzan AB-70 series (AB72 and AB76) pneumatic suction wand eliminates the risk associated with the handling of suction wands. There is no need to remove the drums individually from the pallet, simplifying the unloading operation. The Murzan CBTU (Marinated products transfer unit) can increase yields, increase production, reduce labor costs and reduce sanitation costs. It can be accomplished without compromising the integrity of your product. The Murzan ABDT is a high capacity drum unloading system, used for transferring heavy products such as beverage bases, juice concentrates, and tomato pastes. The Murzan PO-50 Poultry Pump is the only sanitary diaphragm pump specifically designed with the needs of the poultry industry in mind. 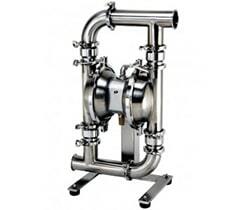 This pump can easily handle solids up to 4? (10 cm) in diameter or 7? (17 cm) long without damaging the product.